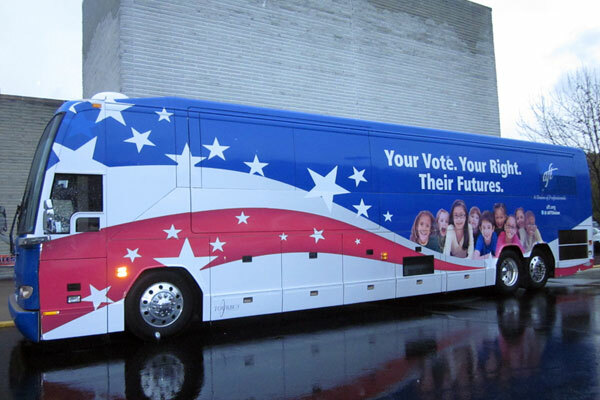 Over the years, we’ve had the privilege of being the premiere charter bus rental for various political campaigns across party lines. We know your causes are important to you, so we go the extra mile to make sure, your transport is arranged flawlessly, so you can work on what matters the most to you, your causes. Whether you’re a Democrat, Republican, Libertarian, Green Party member, or any other party member, we work to make sure your campaign is effective. We want to make sure you stay in the know by offering you onboard WIFI to help you stay connected throughout your campaign, as well as Flat screen monitors. Our vehicles are also equipped with power outlets so your devices stay charged and ready for communication. We can guarantee you will have the best in cabin experience, with our comfortable reclining seats, top of the line entertainment center, Kitchenette, and Lavatory to make sure you are well rested and relaxed to put all the energy into campaigning. Our drivers and crew also make sure you get the best in-cabin experience, that’s also our promise to you. Also, we can wrap our vehicles with whatever slogan/branding you wish to display, so you can get your message across. Contact Us, now for a FREE quote!